A mission more than eight years in the making, NASA launched the Mars InSight lander Saturday. The expedition will give scientists a new understanding of the geology and history of Mars—and perhaps the Earth as well. Launched on an Atlas V rocket from California’s Vandenberg Air Force Base shortly after 4:00 am PT (7 am ET), the spacecraft will endure a 6.5-month flight to the fourth planet. There, it is expected to touchdown on Nov. 26, using a combination of heat shields, parachutes and thrusters to slow from 13,200 miles per hour to 5.5 mph in seven minutes, according to Stu Spath, the Lockheed Martin manager who led the team that built the space probe. 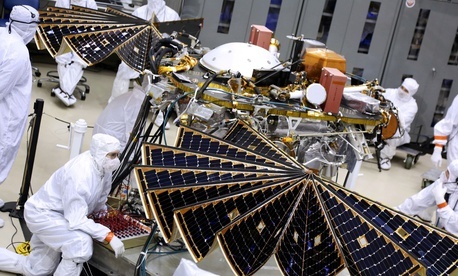 After InSight touches down, a robotic arm designed by NASA’s Jet Propulsion lab will deploy two key instruments: A seismometer developed by the French space agency, which will be covered with a dome to protect it from winds and vibration, and a probe built by the German space agency that will burrow five meters underneath the martian soil. There, it will measure the temperature of the planet. Data from these sensors will enable planetary scientists to understand how Mars evolved over time and develop a picture of the planet’s internal structure, which is expected to shed light on the evolution of earth and the other rocky planets that occupy the interior of the solar system. The information InSight gathers could also shed light on the possibility of microbiotic life on Mars today or in the past. Evidence of ice on Mars along with more methane gas in the atmosphere than expected could mean extra-terrestrial bacteria eking out survival in some cranny of the martian surface. All this data will be relayed back to earth from several NASA satellites already orbiting Mars, through the Deep Space Network that supports all of the space agency’s interplanetary missions. A Lockheed Martin control room in Denver will stay in touch with the lander, along with half-a-dozen other space missions that are controlled there. InSight is the first mission that NASA has sent to Mars since 2013. The mission also includes two small “cubesats.” Two years from now, NASA expects to launch its next mission, a rover known as Mars 2020. While the Trump administration is officially shifting its near-term space goal back to the surface of the moon, the push for Martian exploration remains a key goal at the space agency, and at private companies like Elon Musk’s SpaceX, which is building a rocket designed for interplanetary journeys with the hopes of launching a crewed mission to to Mars within the next decade.